A Classic Never Goes Out of Style! 28 Antique Engagement Rings We Love! They have lived and been loved; they are uniquely romantic, and offer an original story that is one of a kind. Yes, we’re talking about antique engagement rings! We love the intangible charm and history of these pieces, carrying generations of romance and blessings. You will not be wearing a uniform like most diamond rings that modern makers produce, but something that has an unique character. Antique ring styles span a huge variety of looks, gemstones, and materials. In addition to knowing your 4C’s, we strongly encourage some research on gemstone lessons. The main influence on the style is the period when the ring was made. From nature-inspired Georgian period, romantic Victorian period, artistic Art Nouveau, graceful Edwardian period, colorful Art Deco period, to bold Retro period, each has its own distinct style. 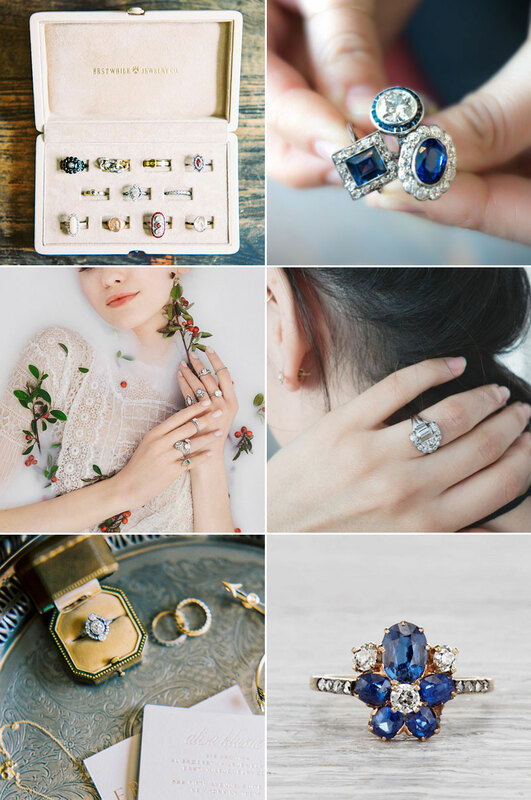 Here are some of our favorite antique engagement ring jewelers, get inspired to find your special piece and add to its memoir with your own legacy! At the very heart of Trumpet & Horn is a family passionate about finding vintage engagement rings that tell a history in the modern world. We absolutely adore antique jewelry and can’t wait to share our love for it with you. We’re committed to conflict-free, environmentally conscious engagement rings. We know how important eco-friendly rings are to our customers, and we are here to make sure you’ll feel good about your engagement ring! Susie Saltzman offers a bespoke alternative to the traditional engagement ring puchase by helping couples all over the world custom make fine jewelry for the moments in our lives that truly deserve to be “one of a kind”. Susie combines her expertise in diamond and gemstone grading with her passionate creativity to bring her custom designs to life. Fine antique & vintage jewelry source known for engagement rings owned by Jared and Alisa. Our collection of rare antique and vintage jewelry is carefully hand-picked, with attention to detail and history. Jared is a 5th generation antique jeweler and has an extensive knowledge of jewelry from 19th century, Victorian, Edwardian, French Art Nouveau, Art Deco and retro ’40s through modern ’60 and ’70s. In addition to working with some of the world’s most exciting jewelry designers, Catbird designs and manufactures their own Catbird line. Their mission is to make beautiful, sparkling jewelry that will bring you joy now through forever. They believe that even very special jewelry can be worn everyday.